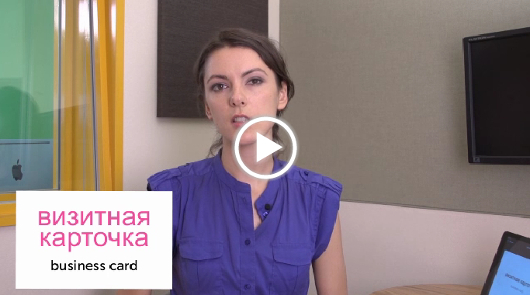 NOTE: I highly recommend this online audio course as another course alternative for Russian. UPDATE (Feb 2017): Since initially writing this review, RussianPod101.com has significantly improved in terms of its overall quality and content amount. They’ve since produced A LOT of great new video lessons with their instructor Katya and the user interface has been substantially updated. It can be hard to find good, reliable resources for learning the Russian language. I became a fluent speaker of Russian while doing language immersion in Russia recently and I can say from experience that it was a daily struggle without good learning material. For such an important language like Russian there’s a disappointing lack of quality audio and video material online for learners like us. The best online audio resource for learning Russian that I’ve seen is this one here (if you click here and scroll down to where the sample audio is you’ll see what I mean) but Innovative Language’s RussianPod101 is a great resource too. 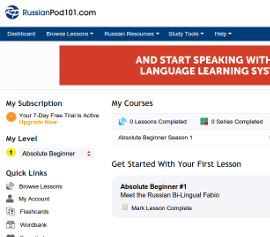 As a comprehensive resource full of audio and video content ranging from introductory and absolute beginner level right through to advanced, RussianPod101 is not just one of the only options but also great as far as online learning tools for Russian go. So just a quick run-down on what you see when you first enter RussianPod101. The RussianPod101 dashboard can be a little overwhelming when you first log in but it helps to know that nearly everything you need is under the Browse Lessons tab on the top left of the screen. All of the lesson content is divided up between either audio or video lessons. Once you click through to one of these sections, you’ll find all of the lesson content under categories on the left-hand side of the screen based on their level of difficulty. 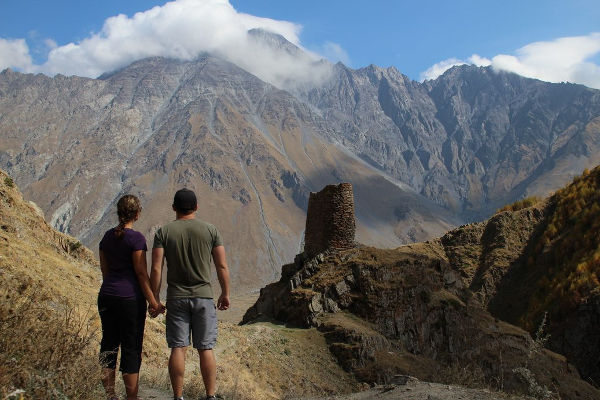 As I said above, it starts at Absolute Beginner and goes through to Advanced but there’s also an Introduction category that familiarizes you with the Russian language, culture, country and history. If Russia interests you then there’s quite a lot in this section that’ll you’ll enjoy. Clicking on any of the categories brings you to a long list of courses which link to topical lessons on just about every real life scenario you’ll encounter in Russia. The great thing about RussianPod101 in contrast with a lot of other Innovative Language editions is that there’s a large and even amount of lessons and content across every level – from the easiest content to the hardest. In some of the other Innovative Language editions like ArabicPod101 for example, most of the lessons are only at Absolute Beginner level and then there’s not much else beyond that. RussianPod101 therefore appears to be one of the most comprehensive and complete editions they’ve made. The lesson delivery and style of RussianPod101 is quite unique in that each lesson is a podcast where two people explain the target for the lesson (similar to TTMIK if you’ve ever studied Korean before). I’ve often said in the past that I don’t personally enjoy language learning podcasts because I’m a pretty impatient guy and I like to get straight to the point but for many people this provides an interesting and non-overwhelming way to learn. The good thing is if you are like me and don’t want to listen to a conversation about Russian that’s mostly in English, you can actually just listen to the Russian dialogue directly by clicking the Dialogue feature. You’re also able to download the dialogues as MP3 files which then makes a handy repetitive listening tool when you’re not sitting in front of the computer. 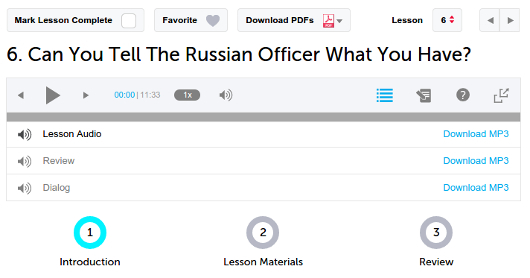 Two of the best features of the RussianPod101 lessons are the PDF lesson notes and the line-by-line vocab and expressions. The written notes that accompany every lesson on the site are incredibly detailed and comprehensive – in fact some of the most impressive work on written lesson material I’ve ever seen (and I work as a language educator!). Someone has clearly put in an enormous of time and detail to explain each concept for you (again, RussianPod101 contains much better content than some of the other Innovative Language titles that I’ve seen). As well as being able to listen to the entire Russian dialogue, you can click on the ‘Line-by-line Audio’ and ‘Vocabulary’ features to listen to individual parts of the dialogue which are written in Russian, English and Romanized Russian (Russian written in English letters). 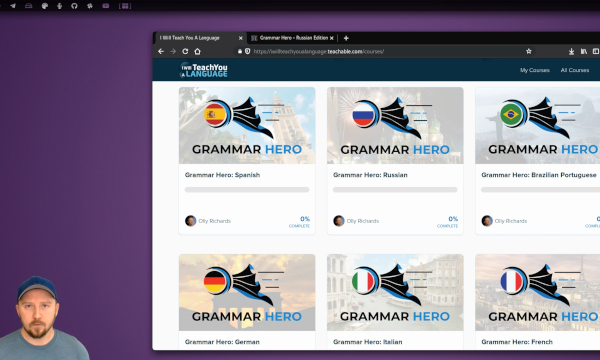 If you need help with pronounciation, you can also record your own voice and compare it to the native speaker’s voice using their recording tool (though a native speaker teacher is always going to more helpful for this). If you come across new vocabulary, you can add them to your word bank or send them to the inbuilt flashcard app (which is another great Innovative Language feature). Then if you want to test how well you’ve learned the content, there’s a review section with multiple choice and written quizzes at the end. 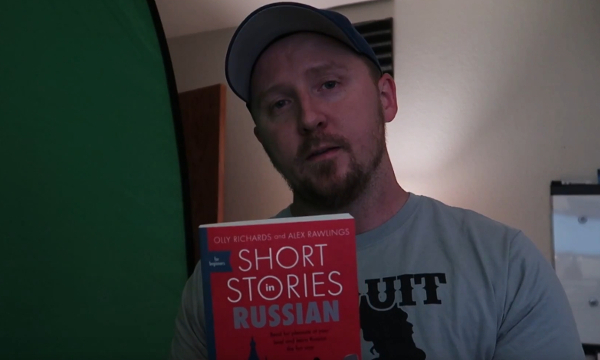 What about the RussianPod101 video lesson quality? Some of the videos are frankly rubbish and others are absolutely excellent quality. UPDATE: Video quality has improved substantially since this review was first written. As I said in my ArabicPod101 review, a few of the vocabulary video lessons are frustrating because they’re basically just slides of images with annoying elevator-style music that’s meant to be a backing track but is actually playing louder than the voices so you can’t hear the words clearly. The two series of videos which I think are effing brilliant are the ones by Katya and the Bonus Listening Comprehension videos. Katya’s a Russian woman who goes through various expressions and vocabulary teaching you how to pronounce and use them. She’s got a great personality and her lesson delivery is effective and easy to follow. The Bonus videos for listening comprehension are really challenging but probably my favorite out of all of them. You’re shown images and have to listen to dialogue in Russian carefully to make decisions and select the right answer. It’s a fantastic way to get you really honing your listening skills. There’s no shortage of video material on RussianPod101 and just as the audio content is quite thorough so are the video lessons. You’re also able to download the PDF and video files. Just a quick note on the Russian Resources tab at the top. One of the criticisms I made of ArabicPod101 was that the content in these resources was skant and pointless. For RussianPod101 this is not the case. They’ve actually put in a lot of effort evidently to make a really thorough and useful resource section that explains things like the alphabet, grammar and essential vocabulary in great detail. This is where you’ll also find the online Russian dictionary and you can search for either single words or whole expressions which return both a written and audio search result (many of the audio search results are in both male and female voices too so you can hear the variation). I personally love the Word Lists which you can add to the in-built flashcard app or even run as a slide show. Does the RussianPod101 approach work? There are two important responses I received from Innovative Languages that I’ll share with you here. Innovative Language believes in practical expressions, aligned to CEFR proficiency levels, in the natural context of native speech. Most lessons, then, begin with a dialogue in which a language skill is introduced in context. The rest of the lessons then go on to talk more about the cultural context in which the dialogue takes place, and the key vocabulary, phrases, morphology, and syntax that allow the learner to carry out the particular language task. As I’ve said before, I believe this is a right approach to teaching and it works. Especially with a language like Russian where the conventional approach is to go through grueling grammar lessons first, RussianPod101 just focuses on natural use of the language – teaching in context. Most modern communicative teaching methods focus on this same approach and are much more effective in bringing students to fluency than tedious memorization of rules. The native speakers who create the content have a lot of freedom to choose what they teach, though we have a few standard series, such as Survival Phrases, that teach roughly the same kinds of expressions across all of our languages. Innovative Language lessons are aligned to CEFR levels, and we typically ask that teachers try to teach to a standardized set of internal Can Do statements when preparing the dialogues and the grammar and vocabulary information. What you’ll find with all Innovative Language editions is that there is some consistency across all languages – especially with the Beginner level content. When you get to the higher levels however, the native speakers who the work has been contracted out to have more flexibility to produce unique and interesting content. This can be both a good thing and a bad thing. One of the comments I made regarding ArabicPod101 was that the content appears to be far too haphazard – it’s all over the place and lacking clear direction with a desired learning outcome. I think RussianPod101 does a better job at not making this mistake. There is a real risk when you hand over content creation to various people that things will get sloppy but the team at RussianPod101 seem to have maintained some great consistency on quality and content. Just a new update to this last point of mine regarding RussianPod101’s haphazard structure. It’s clear that Innovative Language has taken steps to significantly improve this issue by including the feature they call Learning Paths which attempts to structure their existing content into linear objectives. For example, currently they have a learning path called Mastering Level 1 Russian which includes 179 sequential modules. You complete a module and then move on to the next one. It’s not a perfect solution but definitely makes the RussianPod101.com content a lot easier to use for brand new learners. 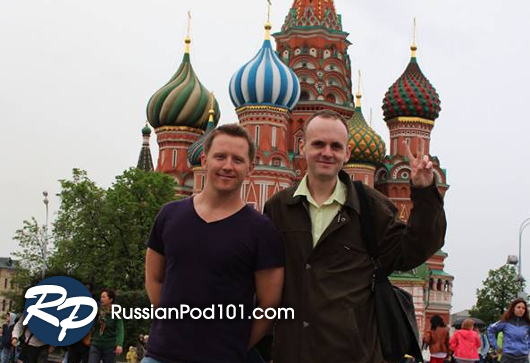 If you’d like to check RussianPod101 out for yourself then you make a trial 7 day account by clicking here. Which is better (or a better deal): Glossika or RussianPod101? They're both very different (and great) products so not really comparable but I would probably have to say RussianPod101 is my favorite tool after using it. A friend passed me some RussianPod (old) stuff that he used before taking actual lessons and it seems user friendly. Subscription based so total cost is unknown. Rocket Russian seems to stop at Intermediate. On the plus side: it is a one time payment of 100 bucks. Not sure what to think of Glossika. My understanding is that they focus more on sentences than overall structure. I believe I can reasonably put 3h to 4h a week learning a new language.